The Annual Report presents to Scottish Ministers and the public the key activities and progress made during the previous year. Our Annual Review records our priorities and investments, and shows how we, with help from our partners, have delivered change in effective, efficient and economical ways. 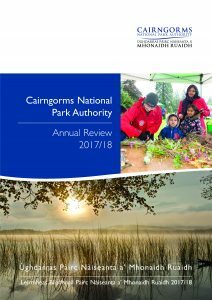 The CNPA Annual Accounts for 2017/18 illustrate how the achievements set out in the review have been delivered within our total resource allocation made available to the CNPA by the Scottish Government.